Elide Bellomo was a dressmaker by trade and lived in Sestri Levante, a resort town not far from Genoa, Italy. When Elide’s aunt became terminally ill, Elide tried to show her as much love and support as she could. Elide’s aunt wanted to be well prepared spiritually when her final moment came. She had always had a fear of death. She showed Elide a holy card of Padre Pio and spoke to her often of him. “Please pray to Padre Pio so that I might have a happy death,” she would frequently say. Because her aunt spoke so much about Padre Pio, Elide decided to make a trip to San Giovanni Rotondo. She would ask Padre Pio in person to pray for her aunt. Elide knew how pleased her aunt would be to hear of her plan. In February 1947, Elide set out for San Giovanni Rotondo. She took a train from Sestri Levante to Foggia and did not arrive in Foggia until the following evening. When the train pulled into the station, she learned that she had just missed the last bus that was going to San Giovanni Rotondo. She would have to wait until the following day for the next bus. She was so disappointed at the news that she began to cry. Elide was exhausted from the thirty-hour journey. The train had been so crowded that she had to stand for most of the trip. In addition, not anticipating the winter weather, she had not dressed properly. She had been cold and uncomfortable since the time she had left her home. The following day, Elide went to Padre Pio’s Mass. After Mass, she waited in line to make her confession. When she heard Padre Pio’s stern voice speaking to a penitent in the confessional, she lost her courage and decided to leave the line. Just as she was preparing to leave, the woman behind her gave her a strong push forward. Soon she was kneeling before Padre Pio. Fear clutched at her heart. Padre Pio’s voice was very gentle as he talked to her. It reminded her exactly of the way her own dear father used to talk to her when she was a little girl. As a matter of fact, Padre Pio used many of the same phrases that her father had used in days gone by. Meeting Padre Pio had made a great impression on Elide and she looked forward with great anticipation to the time when she could make a return visit. Several months later she was able to make another trip to San Giovanni Rotondo. “You are going to move here permanently,” Padre Pio said to Elide. “When the Home for the Relief of Suffering is completed, you will work there.” “Oh no,” Elide replied emphatically, “It would be impossible. I am a dressmaker by profession. I have no skills that would enable me to work in a hospital. Besides, my mother needs me. I would never be able to leave her.” Very gently Padre Pio said to her, “I will take care of your mother myself.” “But if my mother was to get sick, she would want me nearby.” “I will take care of that too,” Padre Pio replied. “You do not have to worry about anything. The hospital is now being built. You will come here and work. It is God’s will for you,” Padre Pio said firmly. On one occasion, when Elide was in San Giovanni Rotondo, she got word that her mother was ill. She returned to Sestri Levanti immediately. Fortunately, her mother’s condition had improved by the time she arrived home. Her mother had always said that she wanted Elide to be with her at the time of her death. She said to Elide, “I am at peace now. Even if I were to die soon, I feel prepared. I think Padre Pio is calling you to live near him. He needs you to help him with his work. I want you to move to San Giovanni Rotondo and assist him.” Not long after that, Elide’s mother had a beautiful dream. In her dream, Padre Pio was standing at the foot of her bed and he gave her a blessing. She died the very next day. One day, as Elide was doing the laundry for the Capuchins, she had the idea to keep one of Padre Pio’s undershirts. She knew that there were very strict rules in place regarding Padre Pio’s personal items. He was not allowed to give any of his possessions away. Elide knew that she could get into a lot of trouble for disobeying the rules. But the temptation to keep an article of Padre Pio’s clothing was so great that Elide gave in to her strong desire. One day, she sent the freshly laundered clothing and habits back to the monastery minus one of Padre Pio’s shirts. The next time Elide went to confession to Padre Pio, she was very nervous. She hoped that he would not guess what she had done and at the same time she knew that it was practically impossible to keep a secret from him. In the confessional, Padre Pio’s first words to Elide were the words that she did not want to hear. “Have you stolen something that belonged to someone else?” he asked. “It is true,” Elide answered. “What is it that you stole?” Padre Pio asked. “I stole a shirt,” Elide replied. “You stole a shirt? Well, who did it belong to?” Padre Pio inquired. “It belonged to you.” At that point, Elide could not contain her emotions any longer and she began to cry. “Well, did you need this shirt that you stole?” Padre Pio asked. “Oh yes, I did need it. I truly needed it,” Elide answered. “Very well then,” Padre Pio said and then he changed the subject. “Now tell me what else you have been doing,” he exclaimed. He never mentioned the “stolen property” to her again. Elide was elated. She was able to keep the prized relic and all thanks were due to Padre Pio. One morning, Elide was standing outside the church waiting for the doors to open for Mass. Two women who were standing nearby were having a lively discussion and Elide could not help but overhear what they were talking about. “I am going to send my guardian angel to Padre Pio,” one of the women said. “I will ask my angel to take a special message to him.” Elide thought that the talk about guardian angels was ridiculous. The women were obviously superstitious. When the Mass was concluded, Elide made her confession to Padre Pio. “Will you always assist me?” Elide asked him. “Yes, I will,” Padre Pio replied. “I will always be near you and I will send you my guardian angel to help you.” Elide realized that Padre Pio was trying to show her the error in her thinking. She was sorry she had judged the women in such a harsh way. Padre Pio’s spiritual children who resided in San Giovanni Rotondo were fortunate to be able to receive Padre Pio’s daily blessing. Often before doing the simplest tasks, like going to an appointment or making a trip to town, they would ask Padre Pio for his blessing. In the late afternoons when Padre Pio took his recreation in the monastery garden, Elide would sometimes stand outside the garden wall and call to him, “Padre Pio, I am right outside the garden gate here. May I have your blessing?” Padre Pio would then open the gate, make the sign of the cross in blessing over Elide and then close the gate. Very satisfied, Elide would take her leave, usually to go back to her job at the hospital. 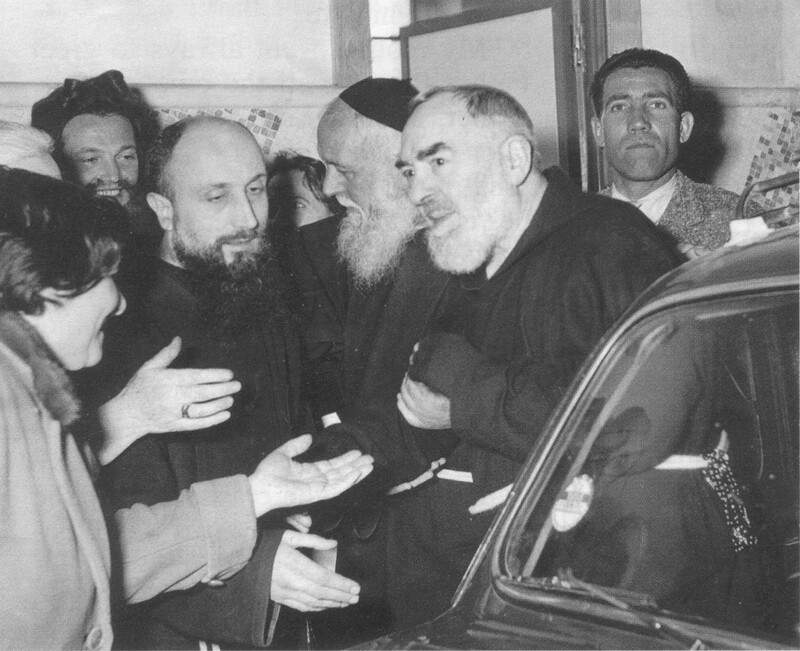 Receiving an individual blessing from Padre Pio was curtailed in 1960 with the visitation of Monsignor Carlo Maccari. Monsignor Maccari was sent to San Giovanni Rotondo from the Holy Office in Rome to investigate complaints that had been made against Padre Pio. There had been accusations in reference to possible financial irregularities at the Home for the Relief of Suffering. There were complaints regarding the unruly behavior in the church on the part of some of the pilgrims. There were complaints about Padre Pio himself. Numerous rumors about him had been circulating for years. Elide was working at the Home for the Relief of Suffering when Monsignor Maccari made his visitation. Monsignor Maccari stayed at the Home for the Relief of Suffering during the time of his visit. Much to the dismay of the Capuchin superior at Our Lady of Grace monastery, he took it upon himself to intercept Padre Pio’s personal mail and read it. Even confidential letters were opened and scrutinized. It seemed as though Monsignor Maccari had brought with him certain preconceived ideas and even prejudices against Padre Pio. Before he returned to Rome, he set forth a number of directives that were to be strictly enforced. People would no longer be allowed to speak to Padre Pio as he was entering or exiting the confessional. The sacristy and the monastery garden became off limits to all members of the laity. A railing was to be built around the women’s confessional to make it more difficult for people to see and to speak to Padre Pio. Elide felt very sad about the restrictions that had been put in place as a consequence of the visit of Monsignor Maccari. Like many others, Elide depended on Padre Pio’s daily blessing. Now it seemed as though it would be practically impossible to greet Padre Pio each day and to receive his blessing. Elide came up with a solution to the problem and she spoke to Padre Pio about it. She told him that when he went to the garden in the afternoon for his recreation period, she would be standing on the other side of the wall. Of course, he would not be able to see her but she would be able to look through the keyhole of the gate and see him. “I would like you to pause as you pass by the garden gate and give me a blessing,” Elide said to Padre Pio. “I will be waiting there.” Padre Pio was happy to agree to Elide’s request. Elide continued to receive his daily blessing, “through the garden wall” and Padre Pio did not break a single rule in doing so. Elide became very proficient as the hospital receptionist and admitting clerk at the Home for the Relief of Suffering. One day without warning, Padre Pio told her that her job was going to be changed. She would become the hospital’s switchboard operator. The hospital had grown and expanded so much that a central switchboard had to be installed. Elide panicked at the thought of being in charge of a busy switchboard. “But I can’t do that,” Elide said to Padre Pio. “I have no experience. I don’t think I would be up to the task. I am afraid that it would be too difficult.” “I want you to do what I am asking of you,” Padre Pio said. Elide complied with Padre Pio’s wishes and a technician trained her in the work. The ease with which she learned the job convinced her that Padre Pio was assisting her. After Padre Pio’s death in 1968, Elide continued to live on in the little house in San Giovanni Rotondo, the one that Padre Pio had urged her to rent. The house had a lovely garden in the back which she enjoyed very much. She was very contented there. She eventually retired from her job at the Home for the Relief of Suffering. Padre Pio had assured Elide that her needs would always be supplied. Time proved the truth of his words. Elide never lacked for anything. She felt blessed that she was able to give the extra money that she had at the end of each month to those who were less fortunate. She truly believed that Padre Pio was watching over her from heaven. I visited San Giovanni Rotodo on January 20, 1960. It was a Sunday and I was spurred on by the usual irresistible desire to be near Padre Pio again for a few days. In the sacristy of the new church, I noticed for the first time, posters everywhere, asking for blood donors for the Home for the Relief of Suffering. 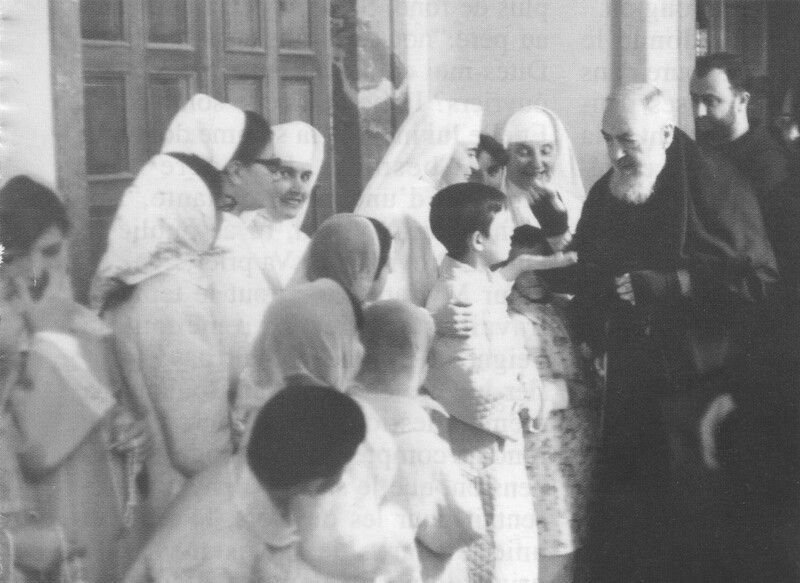 Those who were sick in Padre Pio’s hospital were in need of blood transfusions. My desire to donate blood was so great that my first impulse was to go to the Home for the Relief of Suffering at once. But then I remembered how I had recently had an operation for a perforated ulcer and had nearly died. I also had very low blood pressure as well as pain in my gall bladder. I decided to talk it over with Padre Pio. At the hospital, the doctor examined me and asked a number of questions. When he measured my blood pressure and saw how low it was, he explained that I would not be able to be a donor. “Doctor,” I said to him, “I asked Padre Pio about it a few moments ago and he sent me over here.” I had great belief in Padre Pio and the doctor did as well. He allowed me to give my blood. As I continued to donate my blood to the Home for the Relief of Suffering, my blood pressure improved and the pain in my gall bladder began to disappear. In other words, the more blood I gave, the better my health became. I was able to make fifty-two blood donations for the Home for the Relief of Suffering.